UPrinting is offering 100 postcards to one lucky winner!! If you have a business or if you just want to make your own Thank You note cards...etc..this is a great prize to win! 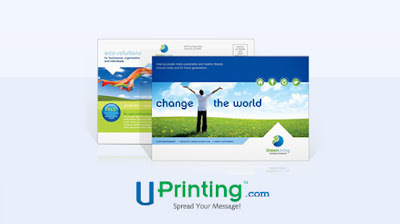 UPrinting does high quality printing and has great customer service! I received some stickers from them awhile back that I custom designed and they came out AWESOME! One reader will receive 100 Postcards! US only. Winners are allowed to win only once over a six-month period. THEN leave a comment on this post stating what you'd use the postcards for. NOTE: Make sure to use the FULL URL (http://www.uprinting.com/postcard-printing.html) and not use any URL shortening tool for the tweet. Twitter will automatically shorten the URL for you. 2. Like Tight Wad in Utah on Facebook - leave comment below stating you did. 3. Sign up for Tight Wad in Utah Emails. - leave comment below stating you did. Giveaway will end Wednesday December 21st at midnight MST. Winner will be chosen by Random.org. This giveaway is sponsored by UPrinting, no monetary compensation was given and I will receive postcard printing service for hosting. Please visit them for more information about their printing services and for your printing needs. I would use the cards as Thank You cards. kristiedonelson(at)gmail(dot)com Thank you. Like Tightwad in Utah on Facebook. Kristie Morrison Donelson kristiedonelson(at)gmail(dot)com Thank you. Get Tightwad in Utah emails. kristiedonelson(at)gmail(dot)com Thank you. Birth announcements for our new little one set to arrive any day! I would have my sons draw a picture and then print it on the post card and use as thank you notes! I would use these for my photo business. I would use them for my new bow business! Like UPrinting Postcard Printing Page. I would send them to friends and family. I liked Uprinting and I would use the postcards to promote my blog. I like Tight Wad in Utah on Facebook. I would use the postcards as a greeting card for the new year! !